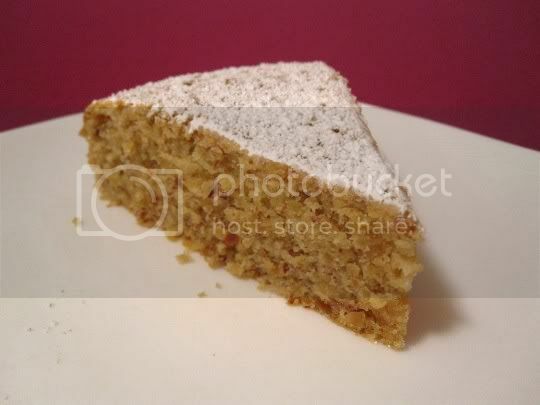 If you like the nuttiness of almonds and the tanginess of lemons, you will LOVE this cake! And when I say the nuttiness of almonds, I mean that literally. This cake combines actual ground almonds (the beauty of a food processor!) with flour for the dry batter ingredients, and the finished product is nutty in both flavor and texture. At the same time, the cake is very moist, hearty, and substantial and filling. Again, thanks to the nuts! Both lemon zest and fresh juice are used in the batter, giving it extra tanginess which really stands out because the cake isn't overly sweet. In fact, it has a slight salty undertone...I'm not quite sure why, but I would suggest maybe completely omitting the salt from the recipe. My only other minor complaint is that the cake tastes a bit eggy, perhaps because they are separated and added to the batter in different stages. Or maybe because there isn't quite enough flour to really absorb them. A layer of powdered sugar on top does add a light sweetness to the cake, but this would be AMAZING served with vanilla ice cream or fresh whipped cream. Make again? Yes. I like that it's a dessert, but a hearty dessert. And anything that goes great with ice cream is a winner!